Tinderbox User-to-User Forum (for formal tech support please email: info@eastgate.com) - Exporting to OPML file? IMPORTANT MESSAGE! This forum has now been replaced by a new forum at http://forum.eastgate.com and no further posting or member registration is allowed. The forum is still accessible via read-only access for reference purposes. If you wish to discuss content here, please use the new forum. N.B. - posting in the new forum requires a fresh registration in the new forum (sorry - member data can't be ported). Tinderbox User-to-User Forum (for formal tech support please email: info@eastgate.com) › Tinderbox Users › Moving to Tinderbox 6 › Exporting to OPML file? I can't see how to do this? I've added the built-in OPML template, but I can't find anywhere to use it equivalent to the drop-down in the HTML view in TB5? Re: Exporting to OPML file? Inspector: HTML is your friend! I have to say that I have always struggled exporting to OPML in tinderbox. It seems unnecessarily complicated to me. Why can't there just be an option. File > Export to OPML. I don't work with or understand HTML. It may seem obvious to people who understand it but it has been always been a barrier for me to fully understanding tinderbox. > Re: Exporting to OPML file? Reply #1 - Today at 4:18pm Inspector: HTML is your friend! Sorry, this is too cryptic for me. Can someone give me a step-by-step guide to getting an OPML file out of TB6? What I mean, is I can see how to apply the OPML template in the Inspector, but having done that I still can't see how to get an OPML file from my selected note & children? I can view the OPML by clicking on the HTML tab in the right-hand pane but not any way to export it. It might help to know how currently you go about the task in v5 so we can try and explain the TB6 approach in the same context. For me, adding a "File -> OPML" doesn't really help unless you want to export the whole doc to OPML, something I suspect doesn't happen to much. You're right, I don't want to export the whole file. What I do in TB5, is to select the note of interest, which will have a set of children, grandchildren, and so on. Then I open the HTML view, select the OPML template from the dropdown, change the file extension to .opml, and hit the Export button from within the HTML view. The controls formerly located at the top of the HTML View window are now in the HTML pane of the inspector. @mrkwr - just what I needed. You probably have them already, but if not the process of getting the OPML export templates (the process uses two) is simple. Just as in v5, go to the File menu -> Built-in Templates -> OPML. TB will create root-lvel container for the templates needed and place the templates inside that. It will also add the 'HTML Template' prototype to the file. Of course, if you're mote expert with OPML you can further modify the templates or simply write your own. The export process simply uses the templates you direct - if set up for OPML, then your export is OPML files, etc. Assumption: you're using the built-in OPML templates. If not insert your appropriate template names in the steps below. The main OPML export template is called "OPML" (same as v5) and uses a recursing child template "OPML Item". Select the container to export. If not already selected, click the '<>' button in the top button bar to select the HTML Inspector. Select the 'Export' sub-tab. It should look like the screen grab in the last post above in this thread. Leave the tick-boxes as they are shown above, except un-tick 'Export Children'. Optionally set 'File Name' for the exported filename without a file extension. Change 'Extension' from '.html' to '.opml (don't overlook the starting period). From the 'Template' pop-up, pick the OPML main template. They are listed by path so in a default set-up with built-in versions it will be '/Templates/OPML'. Optionally set an 'Export' location or use the current setting. You are now set up to export the OPML, but there's one further issue - and it's a glitch I've just reported - you need to use File -> HTML Export to run the export. As such it exports the whole document. To avoid that, for all root level notes/containers - assuming you don't use export except for OPML - that select each in turn in HTML Inspector and untick 'Export' and 'Export Children'. For any ancestors from root to your OPML container, only untick 'Export', so that descendants can still export. As with v5, if you're exporting from a non-root level container (i.e. $OutlineDepth >1) the export to the OS folder specified in the HTML Inspector will occur but nested within a set of parent containers. To explain, if container Z is a child of container Y which is a child of root-level container X and we export to the Desktop, the latter will create a folder X, nesting folder Y which will contain the OPML file for Z. Mark A, thanks as always for this very carefully spelled out explanation. I will confess still to be puzzled here. Like some other users on this thread, I've found HTML export to be the one part of Tinderbox operations that I have not been able to cope with, in either theoretical or practical terms. I know this is user-error on my part, and in it's in the context of finding the overall program invaluable and the new TB6 release a big improvement. But to illustrate in particular: When I follow what I believe to be the exact step-by-step formula you lay out here, I end up not with what I'm hoping to create—a single file in OPML format for use elsewhere—but instead a normal HTML export, with all the large number of nested files. As I say, I believe I have exactly followed the instructions you set out here, choice of templates and all. I don't know how much extra coding would go into an already huge coding task of creating TB6, and I'm well aware that this is not your (MA's) responsibility anyway. But in principle if the File/Export to HTML command could be augmented with File/Export to OPML, I bet a lot of users would find that convenient. It's a way to get the desired result without sleuthing through the intermediate how-to steps. JF. The reason you got all the extra HTML files is because you've exported the whole TBX. In v5 to export just one note, or one part of the overall outline, you use HTML view and the 'Export' button. The later has yet to make it into v6 (I added a note to GB on this today - I missed it as all my big export files are still back in v5). 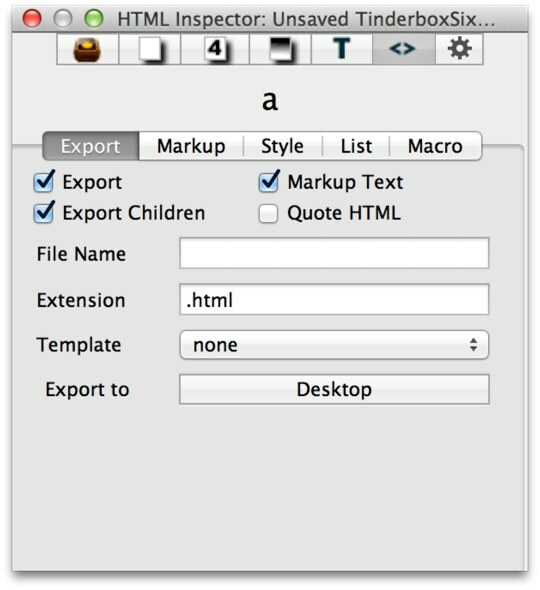 As a workaround, if you need to export a single file you can go to the HTML pane and select the text. I'm using 6.04 b93. So to export to OPML or MyGreatTemplate we have to use the Export to HTML which as menu names goes seems a little inaccurate, why not "Export using selected Template"? In general templates are two note structures with the parent of the notes collection to be exported using the parent of the template and the children notes using the child template. These templates are best obtained from the experts and tweaked as needed. At present the Export to HTML option exports the complete document rather than the collection of notes which is a bug (or a feature). The work around is to view the export in the parent note and copy and paste the output into a text editor then save the file as something dot opml. It is possible to set the template to be used from the "HTML" view of the note but once set it can not be modified from the HTML view, it has to be modified from the inspector. Lastly the help file is not much help on the subject. I beg to differ. The nesting (of built-in) templates is a hint as to purpose but not required. Add whatever templates you need and call them as needed. At present (fixed in v6.05 when it comes) nesting of templates by inexperienced users isn't encouraged (by me) as unexpected issues may arises (for the inexperienced). Add templates and leave them where they're found, unless you really want to tinker. Poor analogy based on flawed assumptions. Better: it's like buying a multi-tool and finding theres' only one type of saw. A hobbyist will try and use a wood saw on a pipe, an artisan will add more saw (templates) to the toolbox. The confusion about HTML lies a long way back. In 2002 (yes - slightly out of date timeline) the ordinary person on the Clapham omnibus lnew noting of HTML, and OPML was yet to be invented. A problem for v6 is the the whole export process was always planned, as I understand it, for v6.1 [sic] after the new UI had been settled in. An unexpected sidebar to this is loss of the ability (as in v5's HTML view) to export a single note/page. Who does this affect - most likely those trying to 'just' export OPML. In the tradition of the man with the hammer seeing everything as a nail, this issue tars everything else in v6. Actually, TB6 is very strong. Single page export is indeed and issue but at present there are more pressing things. Bottom line, export from TB is very capable - getting hung up on 'HTML' labels is self-defeating. I write this as a TB user whose projects mainly involve export, so I'm not an uninterested observer. Tinderbox User-to-User Forum (for formal tech support please email: info@eastgate.com) » Powered by YaBB 2.2.1! YaBB © 2000-2008. All Rights Reserved.